On the 38th commemoration of former Philippine President Ferdinand Marcos’ signing of Proclamation 1081, declaring the Philippines in a state of martial law, Filipino-American human rights advocates in New York City call on the current Philippine President Benigno S. Aquino III to honor the memory of his martyred father, the late Senator Benigno “Ninoy” Aquino Jr., by terminating the national counter-insurgency program known as Oplan Bantay Laya (OBL). Furthermore, Fil-Ams call on Aquino III to also honor the memory of his late mother, Corazon Cojuangco Aquino, by using his executive power to release all political prisoners in the country just as she did after succeeding the 14 year-old fascist dictatorship in 1986. President Aquino’s father is arguably the highest profile victim of martial law in Philippine history. Even before his assassination on August 21, 1983, Ninoy Aquino spent a good chunk of his political career vehemently opposing martial rule. It was the entire Aquino family that suffered, including young Aquino III, when the high-profile opposition leader was arbitrarily thrown in jail over false charges of murder, illegal possession of firearms, and subversion. For nearly a decade, Ninoy Aquino languished in a prison cell, forcibly separated from his wife and children, under conditions that debilitated his poor health. History esteems Ninoy Aquino as a great martyr who suffered at the hands of Marcos’ Iron Fist while fighting for democracy, civil liberties, and human rights in his beloved Philippines. The bitter irony of this legacy is that his own son has chosen to enact a national policy that goes against the very thread of these ideals. OBL was launched by the previous Arroyo administration in 2001. It claimed as its objective the annihilation of armed guerilla rebellion in the Philippine countryside. In the entire 9 years of the Arroyo government, OBL failed to meet this objective. 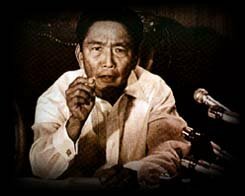 Instead of ending the 40+ year old civil war between the New Peoples Army (NPA) and the Armed Forces of the Philippines, OBL drew international flak for its targeting of thousands of unarmed civilians red-baited by the Philippine military as communist fronts that resulted in a national bloodbath of killings, abductions, torture, illegal arrests and detentions, militarization, etc. Despite its status as a signatory of the Universal Declaration of Human Rights, as well as International Human Rights Law and International Humanitarian Law, the Philippine military under Arroyo bastardized the integrity of this signatory with countless egregious human rights violations, the stifling of basic civil liberties, and policies that imposed a virtual undeclared martial law in the country. Needless to say, it did all of the above with the generous financial backing of the US government. Last month, the heir to the Aquino family legacy disappointingly announced that he would follow in Arroyo’s footsteps of US-funded counter-insurgency and extend OBL under his term. This week, Aquino III will meet with US President Barack Obama in New York City, a beloved adopted hometown of the Aquino family while in exile in the US, to sign-off on the Millennium Challenge Corporation’s Compact Agreement that will seal the deal on a $434-million economic grant from the US government to the Philippines. While such a grand amount could positively contribute to the Philippines if invested in the domestic affairs of the impoverished and socially-burdened country, many are concerned that the amount will be spent instead to sophisticate trainings, weapons technology, and combat operations for OBL, and hence, assist in the proliferation of para-military death squads.. In less than 100 days in office, there have been at least 8 cases of politically-motivated assassinations under Aquino. There are also over 300 political prisoners in the country, including the 43 community health workers who were arbitrarily raided and arrested under a faulty police warrant. The culture of impunity that allows the perpetrators of these human rights abuses to roam free still persists.